1/16/18 – Nine years. $2.75 million in donations and services. 13,000 volunteer hours. Those are the latest tallies from KBE Building Corporation’s 50 Ways to Make A Difference corporate philanthropy program, launched in 2009. The program was established to celebrate the firm’s new ownership, name change, and then-50 years in business. Over the years, KBE has provided corporate donations and employee volunteer time to charitable causes and agencies benefiting children, seniors, and military veterans in Connecticut and Maryland. Earlier this year, KBE hosted its first annual Golf Tournament with proceeds benefitting the 50 Ways program scholarship fund. 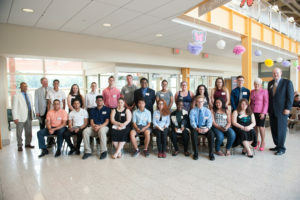 As a result, KBE was able to award $17,000 in scholarships to 34 seniors graduating from the Connecticut Technical High School System in an effort to minimize the continuing labor shortage in the building trades, design, and construction industry. To be eligible, students were enrolled in programs to continue their studies in the building trades, or in a degree program in construction management, architecture, or engineering. In addition, the 50 Ways program hosted its largest ever annual Gift of Gobble event. Between KBE’s Connecticut and Maryland offices, the firm donated 302 Thanksgiving meal kits containing all of the ingredients of a classic Thanksgiving dinner. KBE purchased all food items from Bozzuto’s, Inc. for the Connecticut event, while KBE received a donation of $1,000 in gift cards from Giant Foods to help in the philanthropic effort in Maryland. All cardboard boxes were donated from W.B. Mason. Throughout the last 9 years, KBE has provided Thanksgiving meals to more than 1,700 families, feeding an estimated 10,200 people. With offices in Norwalk and Farmington, CT, as well as Columbia, MD, KBE Building Corporation is a full-service, single-source commercial construction company strategically positioned to serve the Eastern and Mid-Atlantic U.S. Founded in 1959 and incorporated in 1966, the $300 million firm provides preconstruction, construction management, design-build, and general contracting services to clients in the retail, educational, senior living, federal, corporate, hospitality, health care, and institutional markets. KBE’s team of 120+ construction professionals and support staff is deeply committed to the firm’s corporate philanthropy program, 50 Ways to Make a Difference. Established in 2009 to celebrate the firm’s new ownership, name change, and 50 years in business, 50 Ways has helped KBE associates donate more than $2.6 million and 13,000 volunteer hours to charitable causes benefiting children, seniors, and military veterans in Connecticut and Maryland.